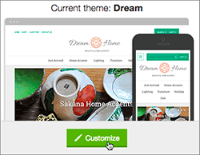 Use these steps to customize your store's theme, change the fonts and headings. Return to the Store Design menu's Theme tab, if you're not already there, and click Customize for your current theme. Expand the Fonts section in the Style Designer, and click the Headings menu, which controls the display of your slideshow's text. Click a font among the Headings choices and you can see it applied to the preview of your slideshow. Once you're satisfied with your choice, click Save & Apply at the bottom of the page. Is it possible to insert a hyperlink on a slideshow image? Slideshow pics are being cropped! SLIDESHOW GLITCH: Captions are missing!